Superb and detailed Art Deco era diamond cocktail ring made of platinum with a swirl dome and entangled spirals design – probably late 1930ies. The ring is fully paved with 78 transitional round brilliant cut diamonds of various sizes including a 0.50 carat centerpiece and having a total estimated diamond weight of about 2 carats. All diamonds including centerpiece have an exceptional F-G color and average VS1 clarity. The ring size is 53 (US size 6 ¾, UK size N) and gross weight is 9 grams of platinum. Diameter of top face of the ring is about 20mm (0.8”). The ring is hallmarked with text “100 IRID 900 PLAT” for PT900 platinum content, as well as marked with what appears to be a “JB” initials maker’s mark. There is also another sort of an insect like hallmark. Most likely of a US American make. The ring has an exceptional appearance and sparkle and is in an absolutely perfect condition. The diamonds setting style and craftsmanship are of highest quality and standards and are comparable to antique jewels made by the top American jewelry firms of that time like Tiffany & Co., Raymond Yard, etc. Ring box shown on photo was used for display purposes and is not included with the ring. 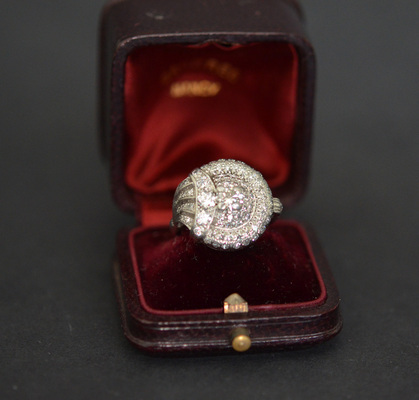 Scarce and superb antique jewelry collector piece and one of the rare Art Deco diamond rings and jewels.